This blog often discusses theological theory. In doing so, there is the risk of succumbing to "ivory tower" thinking that is disconnected from real life. However, for me, Trinitarian, incarnational theology rings true precisely because of its inseparable connection to real life and ministry. This connection is often noted and explored in the discussions that are a key part of the online course I teach at Grace Communion Seminary in Trinitarian Youth Ministry. My students wrestle together with the teachings of Trinitarian theologians Andrew Root, Dietrich Bonhoeffer, Thomas F. Torrance and others. What they find is not "ivory tower" stuff that makes no difference in real life, but stunning truth that speaks directly to real life and ministry. Finding this connection is not forced, for the very basis of Trinitarian, incarnational theology is the reality of the presence and ministry of the incarnate Son of God in our world through the Holy Spirit. This theology thus speaks to our real sharing in what Jesus is actually doing in our world now - a ministry, which Bonhoeffer and Root after him, refer to as "place-sharing" (Jesus, in his humanity, sharing our place). Perhaps the most noticeable change in youth ministry in the early twenty-first century is the diminished role of denominations, youth programs and events in favor of relationships and spiritual practices - those ongoing activities of the Christian community that shape us in relationship to God and to one another - as the primary vehicles through which adolescents recognize God encountering them.... [Such practices] embody Christ's suffering love, thereby preventing Christianity from deteriorating into abstract intellectualism or vapid generic "feel good-isms." And, by enfleshing God's love in word, deed and divine accompaniment in daily life. In short, faith practices allow young people a way to encounter God without needing a priest, a program - or, for that matter, an adult - to guide them" (p34, from The New Rhetoric of Youth Ministry by Kenda Creasy Dean). If youth ministry is to avoid [the] deadly traps of self-justification and isolation, it must move boldly into deep theological construction. What I mean is that we must begin to see ourselves not primarily as youth ministry directors but as theologians who do constructive theology in the context of ministry with the adolescent population. ...All pastoral ministry needs a turn to the theological (p39, from Go Is a Minister, by Andrew Root). ...Ministry always precedes theology and becomes the fodder for constructive theological thought because of our claim that God is living and active in the world - which means that God is a Minister. By looking at God's Ministry of creation, covenant, incarnation (including crucifixion and resurrection) and Pentecost, it is obvious that God is not a theologian but a (the!) Minister. God has committed to be the Minister of creation, and theology is reflection on and articulation of God's Ministry. If we confess that God is active, that God is moving creation to its completion, then ministry is participation in God's own act of Ministry, and theology is nothing more than reflecting on God's action. And if it is true that God is alive and moving in the world as Minister, then all constructive theological work must be done in conversation and connection with this same world to which God is in God's tri-unity. To be in contact with this world is to be in ministry, and therefore is to do theology. ....Youth ministry is ministry that seeks to connect not primarily to adolescents but to God's own Ministry as God ministers to adolescents. ...Ministry is [thus] a theological task, for if it is ministry of the gospel it seeks to be faithful to God's own Ministry (pp40-41, from God Is a Minister, by Andrew Root). If we view ministry to youth (or to any other age cohort, for that matter) in this way, what difference will that make in how we practice ministry? Your comments are welcomed. 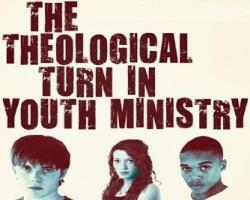 For another post discussing The Theological Turn in Youth Ministry, click here.